Play Duke Blue Devils +2. It seems like these two have been treading water waiting for this rematch of their February 18th instant classic that saw Duke beat North Carolina is overtime 92-90. In that game, the Dukies trailed almost the whole way and trailing by 10 with just 3:17 to play. The Dukies shot a blistering 10 for 16 from behind the arc to make up for a 16-31 debacle at the foul line. The other key to victory in that game was holding the Tar Heel’s best player Marcus Paige (13.2, 2.9, 4.4) to just five points on 2-11 shooting. Quinn Cook was the offensive hero for Duke that night with 22 points while likely national Player of the Year Jahil Okafur was “held’ to “only” 12 points and 13 boards. 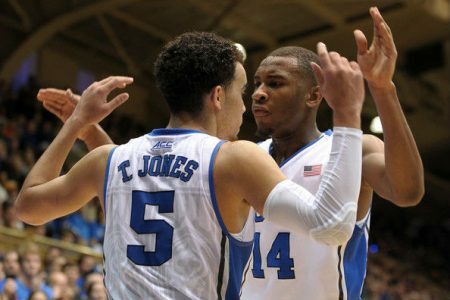 Duke has won ten straight including five straight on the road but four of those were against teams that won’t make the tournament. North Carolina has struggled all year from an ATS standpoint and especially in conference. The Tar Heels have never fully recovered from the Duke loss and are 4-5 in their L9 losing two of their L3 at home. UNC has won three of their L4 overall but that includes Georgia Tech twice and the Heels haven’t beaten a top 50 outfit since beating NC State on January 14th. In the end and besides the rivalry, Duke is playing for a regional one-seed and can go a long way to that end with a win here. Take Duke to win here, their fifth in the last six games of the series. Madness so now is the time to start thinking about an NCAAB or 30 day subscription. It will be one of the most profitable things you’ve ever done.